Organizational History - The Vision Behind the Vision - INVESTING IN ONE OF CANADA'S MOST PRECIOUS NATURAL RESOURCES, THE HUMAN-ANIMAL BOND. I would like to begin by briefly sharing a little bit of my story with you that inspired the vision behind the corporate vision. The Vision Behind The Vision started with a little girl who envisioned people and animals loving each other just for being. Had it not been for the Human-Animal Bond she experienced in her formative years she may not have survived her childhood. The Human-Animal Bond gave her three gifts the ability to embrace the present, learn from the past, and inspiration for the future. In order to keep these gifts she knew she must give them away. 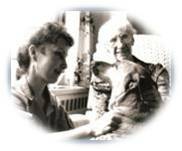 On her fortieth birthday,The Canadian Alliance for Animal Assisted Support Services was registered as a national non-profit organization. Joanne Moss' a Canadian resident was born in Ottawa, Ontario. As a child she was drawn to stray, abandoned, abused, and injured animals. There was always an instant unspoken connection between them which taught her that the only thing more costly than loving is not loving. While serving others in the community she eventually introduced the Human-Animal Bond to other hurting and marginalized people. Joanne was eventually trained in Humane Education and designed a 'Fun and Safety Around Animals Program' for grade-school children, for The City of Gloucester in Ontario. This peaked her interest in the bond and human-animal interactions opening a door to visit seniors and adults with disabilities with her canine partner Star. The first nine months of Star's life were unstable, she had experienced a lot of abuse and had been severely neglected, nevertheless, in no time Star began to flourish responding to the loving kindness, stability, and training she encountered with Joanne. Part of Star's training was in sign language so that she could interact with people who were deaf. Star passed the Canine Good Citizen test and before long became a smashing hit among many who availed themselves of her companionship. Trying to find inroads to get trained and involved in Animal Assisted Therapy/Activities was like looking for a needle in a haystack so Joanne began doing extensive research and networking to try to get answers, but to no avail. Persistence began to pay off, however, there were many schools of thought, books of all kinds, studies, organizations, and the like. What initially appeared to be a fragmented road block was really an opportunity to create and build an organization that would in time fill in these gaps and connect the dots so that people embracing the Human-Animal Bond would be able to connect with one another to build an exceptional and seamless industry to ultimately benefit those in need and to care for the animals entrusted to them. Joanne became a committed volunteer and long-time participant in National Access Awareness Week and was invited to share her vision with a Workplace Accessibility Advisory Committee (WAAC) in 1997. The WAAC embraced her vision, raised funds, and gave the money to Joanne asking that she follow her dream. Joanne was touched by their attentiveness and humbled by their gift and rose to the occasion, by forming a national nonprofit organization which was incorporated on February 6, 1998. The organization continued to evolve and on February 14th, of 2005 was granted a national public foundation status. The organization’s name was changed to The Canadian Foundation for Animal Assisted Support Services in 2007 to better reflect its mission which is to improve the health and quality of life of people with physical, emotional, and social challenges through partnerships with companion and service animals. Philanthropist, entrepreneur, and humanitarian Dave Smith became the organization’s first Patron in 2007. The famous artist and sculptor Eleanor Milne became a Patron in 2008 followed by Dominic D’Arcy the famous Singing Policeman and entertainer. In 2009 speed skater champion Kevin Frost, his trusty guide dog Nemo, and Chris Irwin entrepreneur, author, and teacher best known for his natural horsemanship in equine assisted learning came on board. Additionally, famous actor, author, producer, and composer Alan Thicke became a Patron of the Foundation in 2009, followed by Major-General Lew MacKenzie (Ret'd). CFAS has been invited to speak to the Federal Minister’s Advisory Committee on Accessible Transportation, the Standing Committee on Human Resources Development and the Status of Persons with Disabilities, The Canadian Urban Transportation Association, University of Ottawa, Carleton University, national television, local radio stations, and to a host of other groups since its inception. The organization is also cited in Canada's Parliamentary Library.